Many of us choose to upgrade our kitchen countertops to stone not only for their great looks but for their durability as well. It’s easy to think of stone as impervious, but the truth is that your countertop is still susceptible to everyday wear and tear, and sometimes accidents happen- we leave a sliced lemon on the counter, or we don’t wipe up spills fast enough. While these aren’t life or death situations, little things like this can cause damage to your stone. Countertop maintenance should be something you are at least aware of. Chances are, the damage done to your countertop is probably cosmetic and won’t pose a threat to the integrity of the slab. It’s very rare that stone countertops are so damaged they split in half- usually the biggest problems people run into (if any) is etching, staining and occasionally chipping- all of which can be repaired to some extent. It’s your decision whether you want to try to fix minor issues by yourself or whether it’s worth it to call a professional. In most scenarios, a professional is your best bet, but if you’re concerned about budget there are DIY methods to repair damage on your own. Just make sure you do your homework first- many of the home-made “remedies” you’ll find on places like Pinterest won’t work for every type of stone, or may require some degree of expertise to get just right. Do I need to seal my countertop? How often should I do this? Some types of stone like soapstone do not require sealing, while others like granite may need it, depending on the color and the density of the slab. Depending on your aesthetic preferences (and we’ll get to that shortly), you will probably want to seal marble and onyx. The frequency of resealing will depend primarily on how often you use your countertop, and what you’re using it for. If you do a lot of cooking and your countertop gets a lot of regular usage, you will want to reseal every 6 months to a year. Before you do this, conduct a simple test to see how strong your current seal is: put a few drops of water on the part of your counter that you use most often. In 15 minutes, check to see if the water has beaded up. If it hasn’t, it’s time to reseal. If it beads quickly, you can hold off for the time being. We always advocate sealing your marble- without a quality seal it will etch, stain and patina quite easily. Some homeowners chose to forego sealing their marble because they enjoy the patina they’ve seen in older marble. We don’t recommend it, but if you fall into this category, just know it will take many years to develop the even patina you’ve seen in those old, stately buildings. If you can’t wait decades to achieve this effect, consider regular sealing and taking special precautions to keep it safe from all liquids and anything acidic (tomatoes, citrus fruit, wine). What should I do if I see a crack? It’s important to distinguish between veining, fissures and actual cracks. Stones like marble, onyx, granite and quartzite have “veins,” or deep, dark lines of color that run throughout the slab. These are a natural characteristic of the stone, and aren’t cracks at all. Veiny stones (especially granite) will commonly have fissures in them- lines that appear to be cracks but don’t actually separate the stone. While fissures are natural and normally have no effect on the stone’s integrity, they can be weak points that with repeated abuse (dropped pans or heavy tools, for instance) turn into small hairline cracks. SHOULD I MAKE REPAIRS MYSELF? Before you consider repairs for your stone countertop, have a professional determine whether or not you’re looking at an actual crack. If it is found to be, just let them fix it. While they don’t necessarily need to be fixed, hairline cracks are NOT a DIY repair job, in contrast to the opinion of some bloggers. It takes an expert to repair the crack so it blends seamlessly with the rest of the stone, and depending on where the crack is, a bad home-repair job can stand out for all the wrong reasons. I’ve chipped it – now what? Chips do occasionally happen- corners and fissures are especially susceptible to them. They can be repaired with epoxy resin, depending on the material of your stone and it’s pattern. While this can be a DIY job (for those with the right experience), as with crack repairs, it’s always a good bet to go with a professional. They can make sure the repairs blend with the natural patterns of your existing stone. 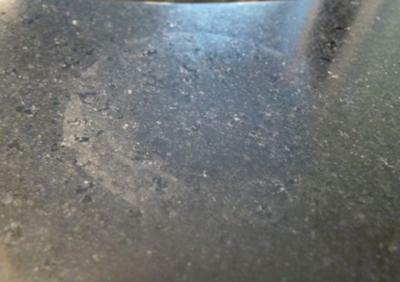 What do I do with all this build-up on my stone countertop? 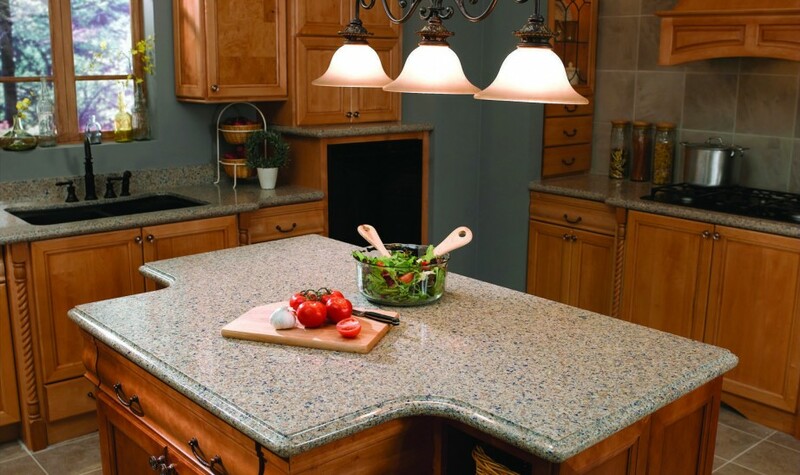 You may notice that in time your stone countertop appears dull or cloudy- this is known as “haze” and could be the result of a soap or cleaner buildup. The good news? The fix is actually DIY friendly. If this is only an occasional problem, you can buy soap film removers or wipes from your local home goods store and take care to always rinse your counters well in the future. You may also consider switching from soap and water to a daily stone cleaner if you have a regular problem with build up (we recommend Aqua Mix Stone & Tile Cleaner). Are these countertop stains permanent? Stains are more easily prevented then cleaned, and the easiest way to prevent them is to clean spills right away, and rinse and thoroughly dry your counters after each use. When you go to clean up spills, blot the affected area and let your cloth absorb as much liquid as it can, instead of just wiping the spill away, which allows the remaining liquid to seep into the stone and stain. Different types of stains may eventually go away, others may not, depending on the type of stone and type of stain. Many websites give recipes for DIY poultices to help remove stains from your stone countertop, but take caution- the wrong cleaner on the wrong type of stain on the wrong type of stone may worsen the situation. You don’t want to risk your countertop on bad advice- just call a professional. This isn’t the color I started with. Some stones like soapstone naturally darken with age. While there’s nothing you can do to stop the transformation, the process can be aided with the help of mineral oil, which will help ensure the slab darkens evenly. Quartz, especially in darker shades, may fade slightly if consistently exposed to direct sunlight. Windows will help protect your counter from the sun’s effects, so unless your stone is in an outdoor kitchen or you frequently leave large windows open, your slab should retain its original coloration. What can I do about etching? This will depend on the type of stone you have and whether or not you consider this to be a problem. Etching is usually a cosmetic issue and won’t impact the integrity of the stone itself, just the surface. Hard stone like granite will etch- but not easily. It takes prolonged exposure to acid before you will start to notice any marks. Softer stones like marble and particularly onyx however, will etch the first chance they get. You will want to seal onyx regularly to prevent etching, but whether or not you want to seal marble is up to you. You can buy marble polish online or from home goods stores that will smooth the surface and make the etch mark less visible, however, after repeated use (over many, many years) you may start to notice depressions in the slab where it has been polished over and over. For large or serious etch marks, and for etching in harder stone where it’s not as common (like granite)- call a professional and skip the home remedies. You mentioned that it takes an expert to repair the crack so it blends seamlessly with the rest of the stone, and depending on where the crack is, a bad home repair job can stand out for all the wrong reasons. My wife called me at work this morning because my daughter left a hot pan on our counter and it made a big mark. Do most countertop materials have to be repaired the same way? Hiring a professional to come and repair our countertop might be our best option. Need a quote on sealing travertine kitchen counters 8 ft.
Hi Dottie, thanks for your interest in Design Works! We’d be happy to help. Would you mind sending us a private email at floridadesignworks@gmail.com with your address, email, and phone number? This information will help us determine which location can help you! Thanks for the interesting tips on countertop maintenance! I was looking into how to maintain countertops before purchasing them. It’s great to learn that some stones like soapstone naturally darken with age while dark quartz fades lightly if consistently exposed to direct sunlight. If I were to choose between the two, I think I would go with quartz since it can be prevented. I’ll try to check out more options and see how they can be maintained before buying.